ExitGlo™ carries a complete line of UL924 listed photoluminescent exit signs rated for three maximum viewing distances 50, 75 & 100 feet. In most cases our 50 foot sign will suit your requirements, but for those situations that require something stronger check out our 75 and 100 foot rated signs. 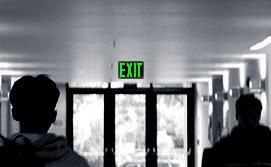 All of our exit signs meet the highest codes, are easy to install and are virtually maintenance free. Every sign on our site is made in the USA and carries a 20 year warranty against manufacturer defects. Call (800) 644-3948 for a free quote ! Photoluminescent exit signs work by absorbing and storing available ambient light, then in darkness they release this stored light in the form of a bright luminous glow. The UL924 standard requires exit signs to be legible for a minimum of 90 minutes at the maximum listed viewing distance of each sign. An exit sign that has a UL924 listing has met the highest building code available. ExitGlo™ UL924 listed exit signs not only meet, but exceed this specification.